In a recent press release Google revealed that it is planning to produce worker robots with personalities. They also own a patent for this ambitious project. These robots will have the capacity to download the personalities from a cloud-based system, store and will be able to display multiple personalities when interacting with humans. Such is the pace in which robotics engineering is being innovated. As there is no specific subject for robotics in engineering curriculum, students looking to develop robotics skills should attend a robotics workshop to acquire those skills. Robotics workshops are a must as Robotics is an area which can only be learnt through hands-on experience. Any amount of textbook knowledge is not sufficient unless there is hands-on experience. To help engineering students in selecting a suitable robotics workshop, here I am listing some of the robotics workshop that they can undergo to develop the necessary skills. Gesture based robotics deals with robots that involve human-machine interaction – where the robot can be controlled through our hand movements. By attending this workshop students will practically learn about the concepts behind the accelerometer sensor, working of a microcontrollers and their programming to build a robot that can be controlled via hand gestures. This will be an ideal course for 2nd and 3rd year students as they will learning about microcontrollers in their curriculum and can use this course to apply those concepts practically. Mobile robotics uses the DTMF or Dual Tone Multiple Frequency to control the robot movements. By attending this workshop students will practically learn about the concepts behind DTMF technology, working of microcontrollers and their programming to build a robot that can be controlled by sending signals from a mobile phone. This robotics workshop is recommended for the 2nd and 3rd year students as they will be learning about the DTMF technology in their DSP subject and attending the workshop will strengthen their skills. 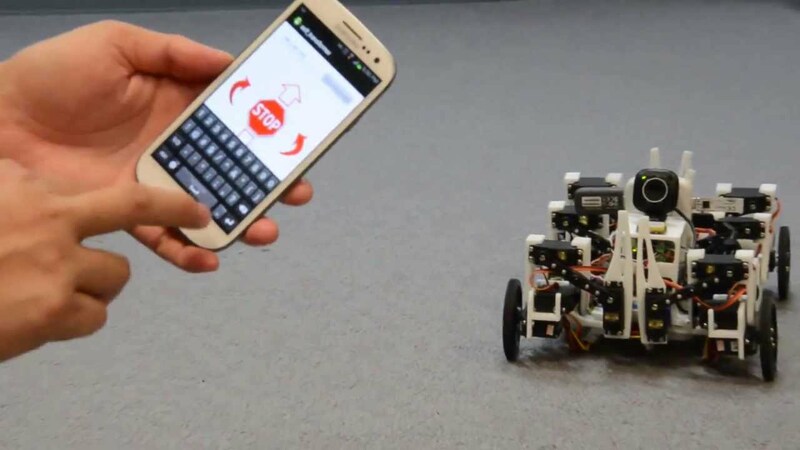 Bluetooth controlled robotics involves the operation of robots in accordance with the signals sent from a smart phone using an Android Application using Bluetooth communication. The robot can be controlled by using a mobile app. By attending this robotics workshop students will practically learn about the concepts behind the Bluetooth communication, establishment of communication channel, microcontrollers working and their programming. This course will be ideal for final year engineering students as they will be learning about wireless communication in their syllabus and this workshop will provide them a good experience. Voice recognition or Speech recognition is the technology through which a machine can identify the words from a spoken language. With Google Assistant, Amazon Alexa, Apple Siri and Microsoft Cortana, voice is emerging as the next interface. The future is going to be full of voice interaction with mobiles, television and even cars! It is already being extensively used in mobile application like Maps.By attending this robotics workshop students will practically learn about the concepts behind Speech recognition technology, Bluetooth communication, Android App development, Microcontrollers working and its programming. This is an ideal course for 3rd & 4th year students to get experience on the latest technology and can use it to build innovative engineering projects. Sensors are one of the major components that are used extensively in robotics projects. By undergoing this course students will practically learn about the concepts behind the IR sensors, sensors calibration & testing, microcontroller working and their programming. Students will also be building 3 different types of robots during the workshop like line follower robot, phototropic/ photophobic robot, obstacle follower/ avoider robot. As this is one of the basic robots, 2nd year – 3rd year students can take up this course to get an introduction and a basic idea about robotics. WiFi has become an integral part of our lives today and the number of devices that is connected to the Internet keeps on increasing because of the advancements in this technology. By doing this robotics course students will practically learn the concepts behind the WiFi communication, Integration of WiFi module, Arduino Architecture and its programming. They will also design their own html page as part of the workshop and use it to control the robot. This robotics course will be ideal for the 3rd – 4th engineering students as they will be learning more about wireless communication in their curriculum and use this to apply the concepts learnt practically. Swarm Robotics deals with the Artificial Swarm Intelligence and involves the usage of multiple robots which can coordinate among themselves to complete a mission. The communication will happen wirelessly between the robots using RF and they move accordingly. By doing the workshop student will practically learn about the concepts behind RF Transmitter/ Receiver, Master/ Slave communication, Microcontroller working and its programming. This robotics course is recommended for 3rd & 4th year students as they will be looking for concepts for their engineering projects and can make use of this skill gained. Maze solver Robot is an autonomous robot that can detect the puzzle lines of a maze with the help of IR sensors and use the data to come out of the maze. By doing this robotics course students will practically learn the concepts behind the IR sensors working & calibrations, microcontroller working and its programming. This robotics workshop will be ideal for 3rd year engineering students as they will be learning more about microcontrollers and embedded C programming in their syllabus. Arduino is an embedded system which acts as the brain for thousands of projects, from everyday object to complex scientific instruments. 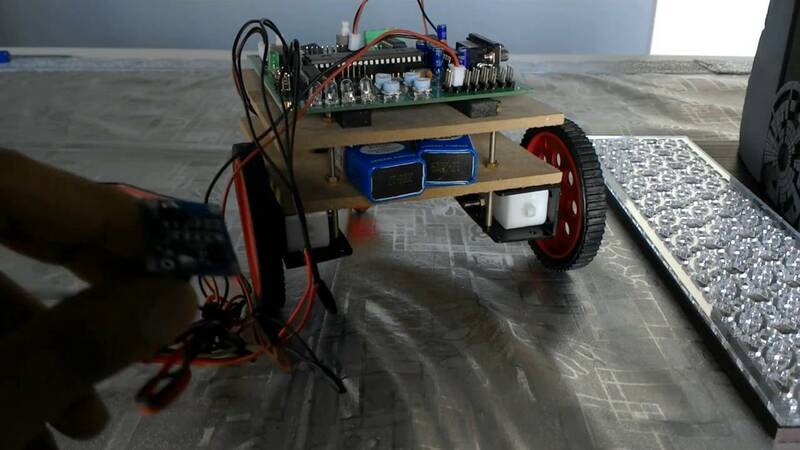 By doing the workshop, students will practically learn to build an autonomous robot that uses IR sensors to detect the path and follow a line. This course can be offered to students pursuing 1st & 2nd year also as it involves Arduino and Arduino Programming and will act as a basic introduction to robotics for them. This is also a great course for students to begin Robotics or to begin their journey on Arduino. 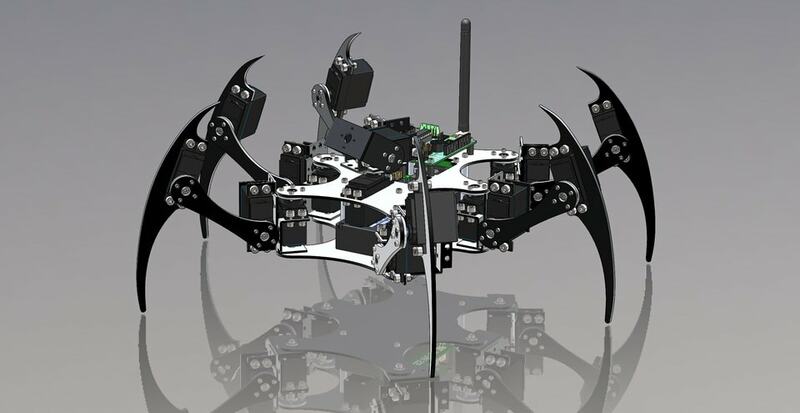 A hexapod robot is a mechanical robot that walks on six legs and is the most famous one in legged robots category. Also, Hexapod robots are very stable when compared with two or more legs robots even in slightly rocky and uneven terrain with flexible movements. By attending this workshop students will practically learn the concepts behind the Servo motors & its working principles, Arduino Architecture and its programming to build a Hexapod Robot. This robotics course will be ideal for 4th year engineering students as they will be looking to develop new technical skills and improve their profile as part of their recruitment preparations. In case you are interested to attend a robotics workshop but not able to find one, you can conduct a robotics workshop in your college itself in association with Skyfi Labs. 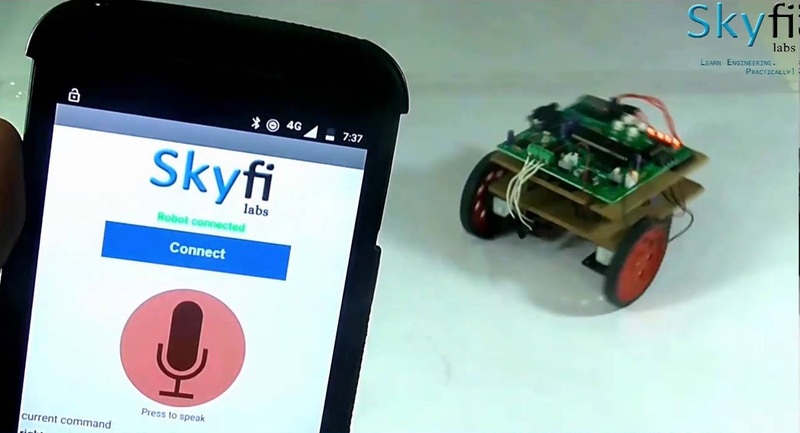 We at Skyfi Labs have developed some amazing hands-on training programs that helps you to learn and build robotics projects in the most simplest way. Our team will be coming to your college upon inviting along with the kits and necessary material and helps you to build robotics projects practically. The Innovative learning methodology which we follow not only helps you to build projects but ensures you are learning while doing so. In case if you are interested to learn and build the robotics project at your home itself, you can enroll for our online courses and build the robotics project from any part of the Earth.